Photo © Cheryl Gerber, Ocean Conservancy. 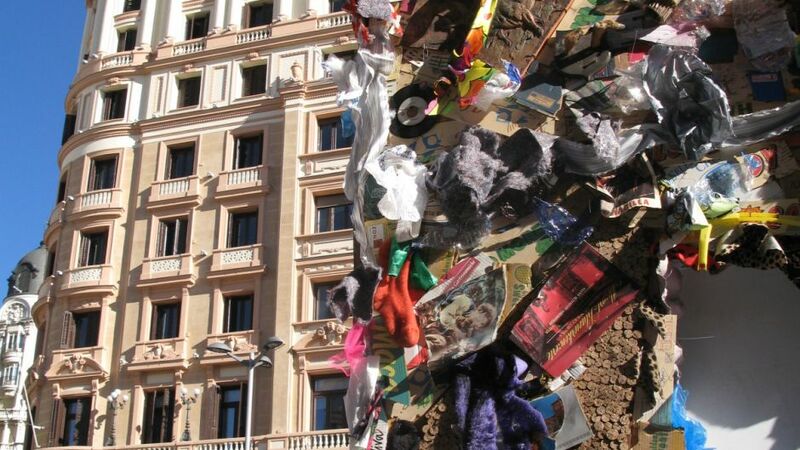 Whether you respect it as an artistic anti-consumption statement or dismiss it as a “marketing party” by its beer company sponsor, Madrid’s Save the Beach Hotel recently attracted consistent queues of people wanting a tour, despite the chilly temperature. The five-room temporary hotel was basically just a large wooden shack decorated and furnished with 12 tonnes of garbage collected from Europe’s beaches and with a small expanse of sand for a front yard. Potential guests vied via web entries for a chance to stay there, apparently not bothered by the lack of running water and one shared portable toilet. “The philosophy behind this hotel is to show the damage we are doing to the ocean and the coast… We live in an era of trash and we run the risk of becoming trash. Do we really want such a world?” asked HA Schult, the installation artist responsible, upon the official launch. Schult has dabbled in garbage for decades. Somewhat of an eco-activism pioneer, he was arrested back in 1969 for a ‘happening’ during which he covered a Munich street in paper and garbage. In 1977 he hired a stunt pilot to crash a small plane into the garbage dump on Staten Island, New York. 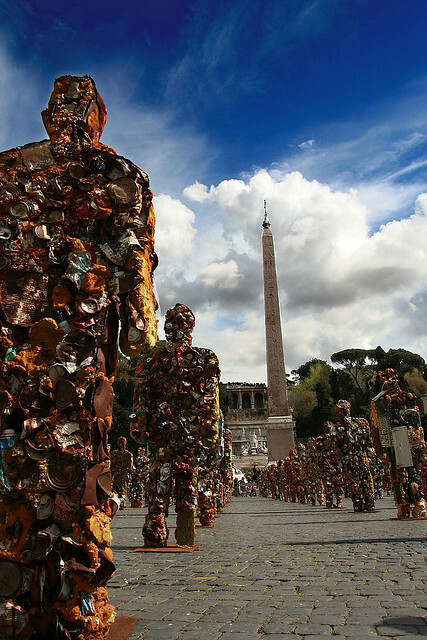 More recently, a thousand of his life-sized Trash People — sculpted from crushed cans, electronic waste, etc. — first congregated at Germany’s Xanten architectural park in 1997, and continue to pop up at many of the world’s landmarks like Red Square, the Great Wall, and the Egyptian pyramids and even in the Arctic. HA Schult’s Trash People in Rome, 2007. Photo by Roberto Ventre. “On the walls of my hotel are all the symbols sold on the Gran Vía [a nearby bustling shopping street], except that here they’re dead,” Schult told El Pais, one of Madrid’s main dailies. The skeptical El Pais journalist, who spent a night in the hotel, saw the project as simply very proficient Corporate Social Responsibility (CSR) hype and indeed Schult’s ideals did ring a bit contradictory to the number of logo-placements I viewed throughout the hotel. When viewed critically, perhaps The Save the Beach campaign that the garbage hotel represents is rather measly, as it is essentially the volunteer-powered clean up of one beach per year. The effort could seem small if you contrast, like the El Pais journalist did, the amount of press coverage (i.e., free advertising) that the hotel garnered for the brand in comparison to what it cost to erect. Of course beer and beach are a natural fit so it’s no wonder really that this big corporate sponsor chose as campaign partners The Blue Flag programme, a voluntary eco-label awarded to over 3,000 sustainably managed beaches around the world, and the Surfrider Foundation that is also dedicated to defending the oceans and coastlines. And yet this joining up with committed artists and worthy organisations may make the CSR seem that much more perverse when looking at the project’s third partner: a regular online travel agency without any green or sustainability concern. Nonetheless, there is no way to measure to what degree awareness is boosted by such things. Here in Madrid, August sees hordes of people heading (most by car) for a traditional vacation type: the beach, with many returning year after year to the same spot. But despite its proximity, according to a Save the Beach poll, one in 10 Spaniards have stopped going to a beach due to its poor state. Meanwhile, 14 percent of the rest of Europe have done the same. Apparently 66 percent of those polled believe that public administrations pay “little or no” attention to the problem. But who is really accountable? Perhaps the empowerment of being able to vote on the Save the Beach campaign’s website for a favourite beach to be the target of this year’s clean up, or simply visiting or reading about the garbage hotel, will have a positive impact on European beach goers, making them feel responsible for their local beach. However in colder northern countries (like my homeland, Canada), winter is the prime beach getaway time, and — as zero-emission farmer Jon Wright recognized in a compelling essay published on Our World back in 2009 — modern day tourism has become so easy that it is a difficult habit to break. (Particularly some might argue, if months of freezing weather leave you susceptible to the “travel bug”.) And when it comes to consciousness of impact, these are faraway places after all, for which feelings of responsibility may be tenuous. Those indulging will hopefully be choosing to perhaps offset their air travel emissions, but certainly to tread as lightly and responsibly as possible where they visit so as not to contribute to the Disappearing Destinations phenomenon. That’s the title of a new book put out by the Centre for Agricultural Bioscience International (also known as CABI) that examines the threats posed to popular and fragile destinations such as the Great Barrier Reef. Places like these, the authors warn, could become severely damaged and forced to close to tourists if current travel trends persist. One of the book’s authors, Professor M. R. Phillips, Head of the School of Built and Natural Environment at Wales’ Swansea Metropolitan University, told me by e-mail that he and his colleague Dr. Andrew Jones put the tome together with contributions from world experts. The book includes ten case studies from North America to the Antarctic that cover different issues, e.g. dive tourism, etc. It also examines the consequences of tourism growth — everything from the plastic problem (trash, Phillips says, ends up behaving as sediment) to the question of tourist resource consumption, like that of drinking water in areas where it is already in short supply — and examines management and policy responses. For those interested in tourism industry research, aside from the book, Phillips also recommends the World Tourism and Travel Council (WTTC) site for statistics and important publications. Even lay people can browse through its Best Practice Gateway for some interesting examples, like a Club Med on the island of Mauritius that wanted to reduce its use of local drinking water supplies and recycle wastewater. The resort ended up with Jardins Filtrants (filtering gardens) — a system that purifies effluent through a series of aquatic plant beds, and uses the treated water for irrigation. For the bug-bitten wanting guidance when choosing responsible/sustainable/eco vacation destinations or tour operators, the WTC also holds the Tourism for Tomorrow Awards and the list of nominees and winners makes a good resource, and the award site’s case studies an interesting read. Then of course there are myriad green travel organisations with guides to offer, The International Ecotourism Society among them. So as farmer Wright argued, perhaps we need to give up the jetting about and instead be learning to love the subtle yet infinite variety of our particular chosen place: our local homelands (be they warm or cold…). Finally, it is important to realize that unfortunately, marine debris is not simply a matter solved by curbing the littering habits of beach goers. As the Ocean Conservancy’s aptly named Trash Travels report explains, improperly discarded garbage can travel long distances in the water, becoming one of our greatest global pollution problems. Marine debris not only has serious impacts on sealife and marine wildlife, but it also affects tourism, fisheries, navigation, public health and water quality. 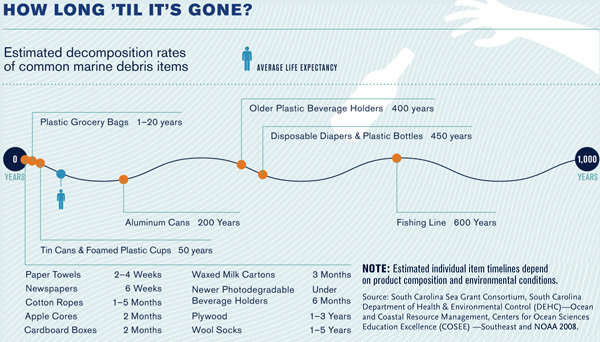 Graphic from Trash Travels, © Ocean Conservancy. Informed by an annual International Coastal Cleanup (sponsors of which incidentally include Coca-Cola and Dow Chemicals), during which a half-a-million volunteers gather data about the trash they remove at more than 6,000 sites around the world, the report includes some mind-boggling statistics. 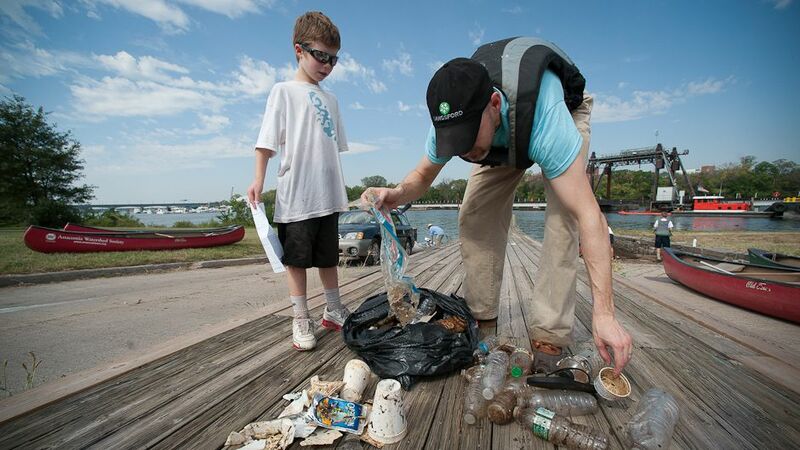 Chief among these facts is that 60-80 percent of marine litter starts our on land. Lakes, rivers, storm drains and wind help trash to travel hundreds of miles to reach the ocean. So in other words, it is not just those on holiday getaways who are hereby entreated to pack what the brought when they are done basking, but it is each of us in our daily life who must reduce, reuse and then ensure that each item of trash we do produce is properly recycled. Vacations in This Era of Garbage by Carol Smith is licensed under a Creative Commons Attribution-NonCommercial-ShareAlike 3.0 Unported License. Sigh…I’m reminded of 1984 (the year, not the book) when I had the good fortune to take university classes onboard a ship as we steamed around the world. I’ve always wondered whether some discarded garbage from our ship made its way to foul some distant beach, or is simply still revolving around one of the great plastic mid-ocean gyres (or revolving around some poor marine creature’s neck). Perhaps some of our discarded trash even comprises part of the Save the Beach Hotel in Madrid? Hmm…I think I might even recognize some of my old possessions from the above photo! Really, though, thank you for this reminder about the enduring impact of our trash. I saw it said once that “throwing away” is a misnomer because there is no such thing as “away.” Out of sight can, at best, be out of mind only temporarily in a closed system such as Earth. I like this post so much. Its really impressive and insightful. I come to know some good aspects which all have to think about during travel. I love Eco Friendly travel and for it i do whatever i can do during travel time. I always suggest people too travel Eco Friendly and provide sustainability to nature and environment. Thanks for this motivated post Carol.